Apple launched new iPhones and Apple Watches last month, so analysts expect Apple to launch new iPad Pros and MacBook laptops at this month’s event. Apple is expected to launch new iPads and potentially laptops at the Howard Gilman Opera House in Brooklyn, New York on October 30. Apple doesn’t usually launch new products in New York, often opting for a venue closer to its home base in Cupertino, California. Last month, Apple revealed new iPhones and Apple Watches, so analysts and rumours have pointed to a launch event focusing on new iPad Pro models and potentially new Mac computers. Two new versions of the iPad Pro which ditch the home button for Apple’s Face ID and larger screens. Currently, Apple’s iPad Por comes in two sizes: 10.5-inches and 12.9-inches. A new thin-and-light MacBook that’s more affordable than the current $US1299 model. One rumour suggests that the new model will have Touch ID, a fingerprint sensor, but will lack the touchscreen Touch Bar found on Macbook Pro models. Potentially, a new Mac Mini desktop that’s oriented towards professional usage. It’s unclear whether this device will have a new redesign or simply updated specs. It’s also possible that Apple will update the specs on its iMac computers, which were last updated in June 2017. Apple has promised professional users a new Mac Pro, but that’s not supposed to launch until 2019, so we’re not expecting to see it later this month. 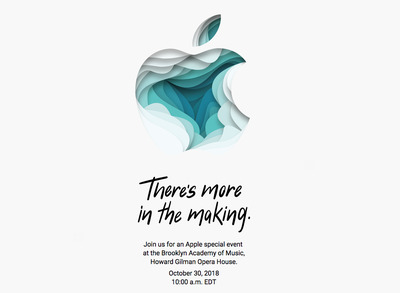 Unusually, this year, each invite came with a different stylised Apple logo graphic, suggesting that this event will focus on creative drawing and graphics uses for the iPad Pro.